In the perhaps not so distant future, surgeons could perform a range of medical procedures all without touching the patient, thanks to advancements in 'acoustic tweezers'. Researcher Asier Marzo checks the strength of the acoustic traps generated by the Holographic Acoustic Tweezers. Surgeons won't be shrunk and sent into the body like in the 1960s Sci-Fi, Fantastic Voyage, but could program a specialised array of mini-speakers to create an intricate sound field that 'traps' and manipulates selected objects in 'acoustic tweezers' for manipulation within tissue. Advancements in acoustic tweezers from Professor Bruce Drinkwater in the Department of Mechanical Engineering, University of Bristol, and his colleague Dr Asier Marzo, from Universidad Publica De Navarra in Spain, are driving the technology towards this futuristic-sounding reality. The team's recent developments, published Dec. 17 in the Proceedings of the National Academy of Sciences (PNAS), demonstrate for the first time the acoustic levitation and manipulation of multiple objects simultaneously. Professor Drinkwater envisions an iteration of this system eventually being used to acoustically stitch up internal injuries or deliver drugs to target organs. He said: "Now we have more versatility -- multiple pairs of hands to move things and perform complex procedures, it opens up possibilities that just weren't there before." Sound exerts a small acoustic force and by turning up the volume of ultrasonic waves, too high pitched for humans to hear, scientists create a sound field strong enough to move small objects. Now Professor Drinkwater and Dr Marzo have enabled the efficient generation of sound fields complex enough to trap multiple objects at the target locations. Dr Marzo explained: "We applied a novel algorithm that controls an array of 256 small loudspeakers -- and that is what allows us to create the intricate, tweezer-like, acoustic fields." Acoustic tweezers have similar capabilities to optical tweezers, the 2018 Nobel prize winner, which uses lasers to trap and transport micro-particles. However, acoustic tweezers have the edge over optical systems when it comes to operating within human tissue. Lasers only travel through transparent media, making them tricky to use for applications within biological tissue. On the other hand, ultrasound is routinely used in pregnancy scans and kidney stone treatment as it can safely and non-invasively penetrate biological tissue. Another advantage is that acoustic devices are 100,000 times more power efficient than optical systems. Professor Drinkwater explained: "Optical tweezers are a fantastic technology, but always dangerously close to killing the cells being moved, with acoustics we're applying the same sort of forces but with way less energy associated. There's lots of applications that require cellular manipulation and acoustic systems are perfect for them." To demonstrate the accuracy of their system, the scientists attached two millimetric polystyrene spheres to a piece of thread and used the acoustic tweezers to "sew" the thread into a piece of fabric. The system can also simultaneously control the 3D movement of up to 25 of these spheres in air. The team is confident that the same methodology could be adapted to in-water particle manipulation in approximately one year. 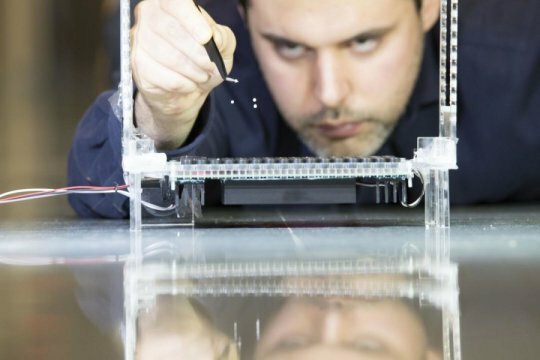 They hope that soon after, it could be adapted for use in biological tissue. Dr Marzo explained: "The flexibility of ultrasonic sound waves will allow us to operate at micrometre scales to position cells within 3D printed assemblies or living tissue. Or on a larger scale, to levitate tangible pixels that form a physical hologram in mid-air." This project has been funded by the UK Engineering and Physical Science Research Council (EPSRC).